1. Would you introduce yourself, your background and tell how Light Mosaics came to be, and what you do. My name is Lisa Hwang. By day, I telecommute as a Financial Consolidation Analyst for IBM. I have joint custody of my 14 year old son, who is an aspiring golfer, and care for 3 lovable dogs (except the 10 month old puppy is a bit of a terror right now). Although, I have been doing finance/accounting for 16 years, I have always dabbled and tried to tap into my inner creativity. I started with B&W photography back in college at Drexel University. I took fashion sketching and handbag/shoe design classes at Moore College of Art. Then, I finished 5 classes towards an Interior Design degree at the Art Institute but realized it was going to cost way too much. While living in Brooklyn, NY, I took ceramics and knitting classes but it was too hand intensive and repetitive for me (I have problems with my wrist stemming from many years of working on the laptop). So, I dabbled a lot and couldn’t seem to find my niche until a few years ago when I bought a mosaic kit. I created Light Mosaics and decided to use my Chinese middle name I-Kwang which means “Harmonious Light” for my shop’s name and logo. 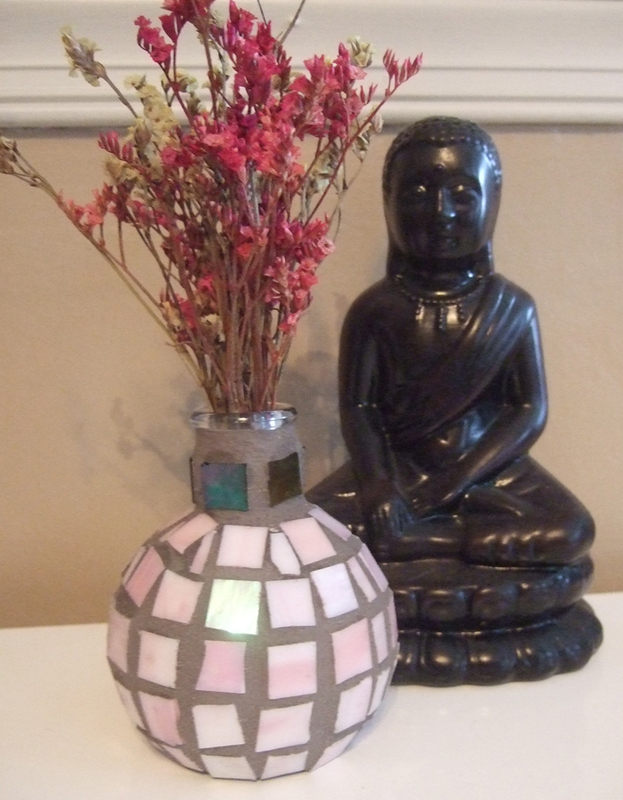 I am a self taught mosaic artist and have been creating mosaic candle holders and vases for a few years for my friends and family. In October 2009, as the holidays were approaching, I couldn’t make these items for the same people, so I decided to try to sell it to the public. I launched an etsy shop, networked through facebook, placed my items in three shops around the city and participated in 3 holiday craft fairs. 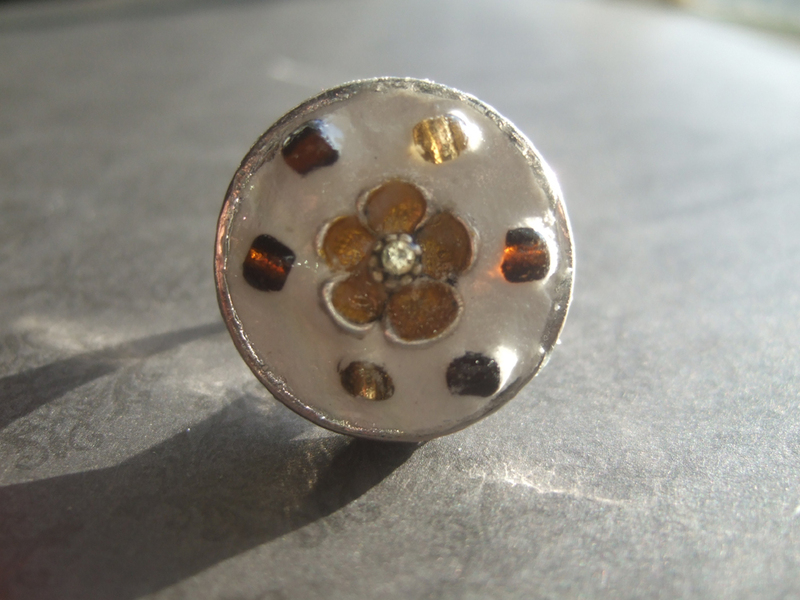 I also expanded my product line and started making pendants, rings and wall hanging jewelry holders. 2. What are your strengths and what makes your work different than others? “Mosaic is the art of creating images with an assemblage of small pieces of colored glass, stone, or other materials.” I think my work has a unique style. 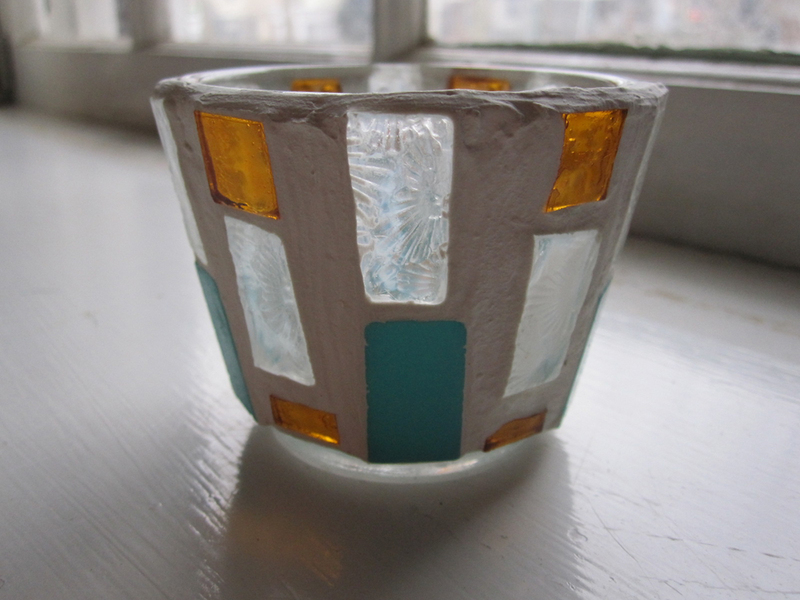 I like the gritty and non-standardized look of my mosaic candle holders and vases. I like to use various colors, and I am biased to using white grout because it makes the colors pop out more. 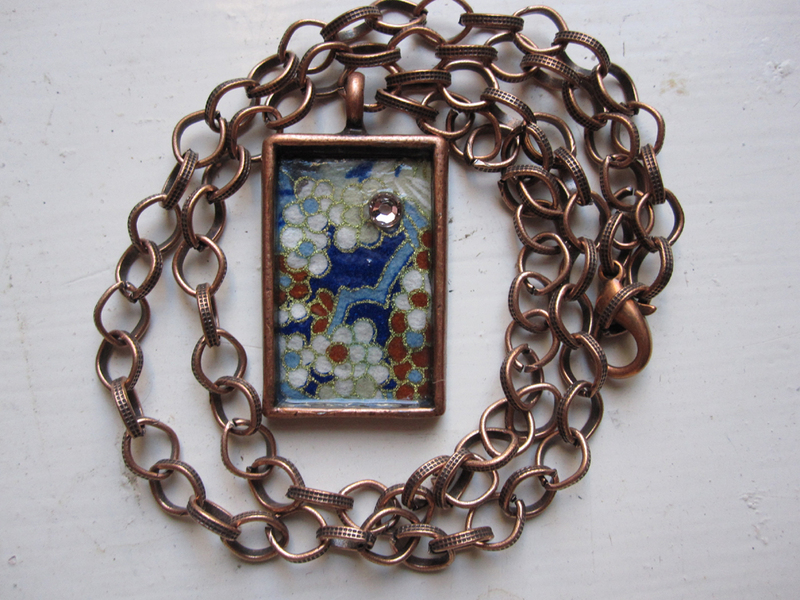 My rings and pendants are designed with the mosaic concept in mind. 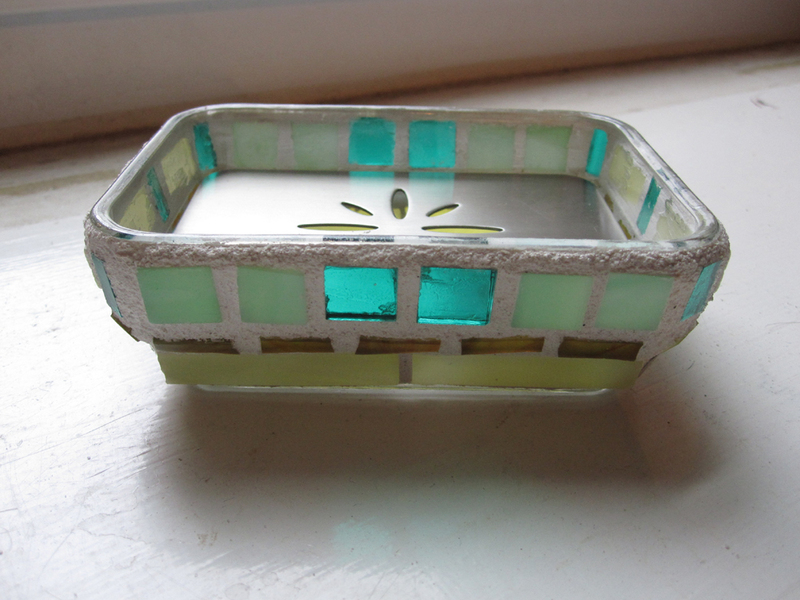 The jewelry holders that I make are not related to mosaics but it was something that I designed and made for myself. I have never seen anything out there like that so I thought I would start marketing and selling them. 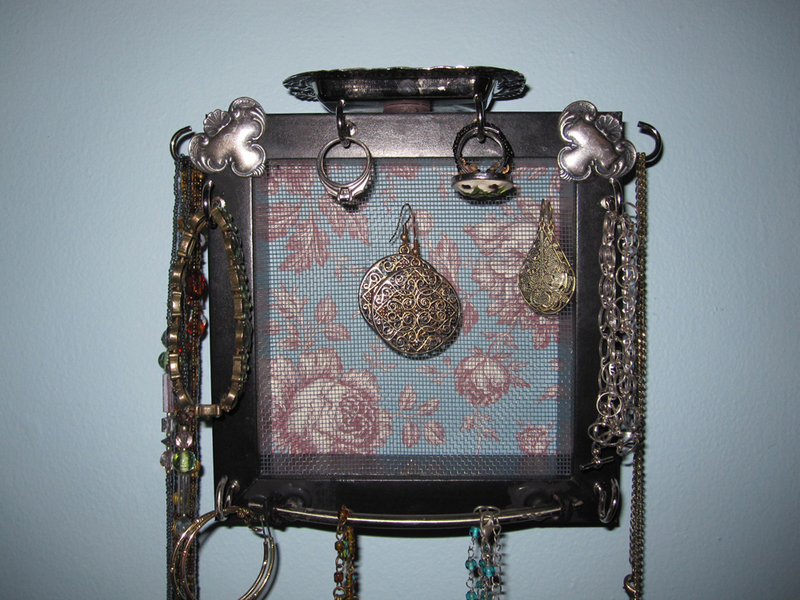 What female wouldn’t want a jewelry holder that holds almost everything in one place? 3. Tell me about your workspace. 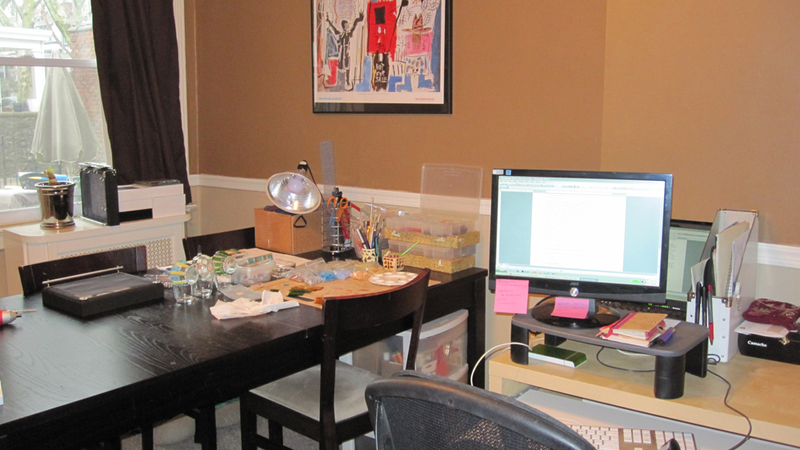 My workspace is my dining room table. Luckily, the table expands 2 leaflets if I need to actually use it. Most of my supplies are tucked away inside a closet and cabinet in the dining room area. I hop between my full time job workspace (on the right) and the dining room table throughout the day. 4. How has the popularity of the internet affected your business? The internet holds a wealth of information and it is also a good communication tool. Facebook has been my primary site for finding information on local craft fairs and networking with other artists. Etsy.com is a good site to sell your work but it seems like you have to be really lucky to be successful. There are over 170,000 shops on this site! From my own personal experience, when I go to search for an item, tons of pages come up. After flipping through 10 -15 pages, I just stop and get frustrated if I can not find something I like at the right price. Artists have to relist or list new items constantly to be noticed. 5. What are your plans for 2010? For 2010, I will be doing craft fairs in the spring, summer and fall about once a month either for the Creative Collective at Headhouse Square on South Street or the Piazza at the Schmidts in Northern Liberties. I have to limit the amount of fairs that I do because I can not make products fast enough because of the process and it’s a busy time of the year for me with my son’s golf tournaments and practices. But, I would like to break even financially and continue to remain a presence in the Philadelphia artist and crafting community. Great interview! I love learning about the creative process and the way in which people balance day jobs with creative passion. Beautiful mosaic work! Thanks Katie for the compliment. I’m still working on refining my process but it’s a process in itself.